This is not investment advice, just what I’ve done. Please don’t do something silly like mortgage your house and put it all in crypto just because some guy on the Internet wrote an article. At the beginning of 2017, with cryptocurrencies like Bitcoin and Ethereum gaining in value and popularity, I decided I wanted to put some money into the market but wasn’t sure when to do it. Ethereum had spiked to an all-time high of $40, and a number of people in the space were saying it was going to crash back down. Bitcoin was around $1200, and people were saying the same thing. They both did come down a little, but since then, Ethereum has almost 10x’d in value, and Bitcoin has gone up about 4x. If you had bought either you would have done extremely well, but it’s impossible to accurately predict these things. For someone just getting interested in cryptocurrencies, there’s the question of when and what to buy. Putting everything you want to invest into one coin at one time isn’t a great strategy since then you’re relying on that one coin to do well from that one point of time. It’s very, very risky. What makes more sense if you want to get started investing in cryptocurrencies is to create your own “index fund” of coins and dollar cost average your investments over time. An index fund, for those unfamiliar with the term, is a collection of assets bought together to offset the variability of any one asset. You could gamble entirely on Ethereum, Bitcoin, Litecoin, Dogecoin, but you risk that one coin crashing. Instead, it’s safer for less-educated investors to spread out their risk across multiple assets. In this case, buying a collection of coins, probably starting with Bitcoin and Ethereum, and adding Litecoin if you’re interested. That accounts for your risk among different assets, but you also want to account for the volatility over time. You could buy them today then have them all crash tomorrow, or you could have them go down for a month only to rebound to double what they are now and end up missing out on buying them at their lower prices. The best way to account for this is through dollar cost averaging, where instead of putting on all your money at once, you spread your buys out over time to account for the variation in daily or weekly prices, while still getting most of the long term benefits of the investment. Your gains won’t be as high as if you perfectly time the market, but they’ll be much higher than if you mis-time the market, and you’ll protect yourself from avoiding buying on the downturns out of fear. Typically, you dollar cost average when buying stocks by buying them monthly, but since cryptocurrencies are moving so quickly, you could buy them in weekly or even daily transactions. I’ve been doing weekly since the beginning of the year. So the best way to start investing in cryptocurrency as someone who’s inexperienced is to buy a collection of coins, not just one, and buy them at regular intervals in smaller amounts instead of buying them all at once. Here’s how I’ve been doing that. 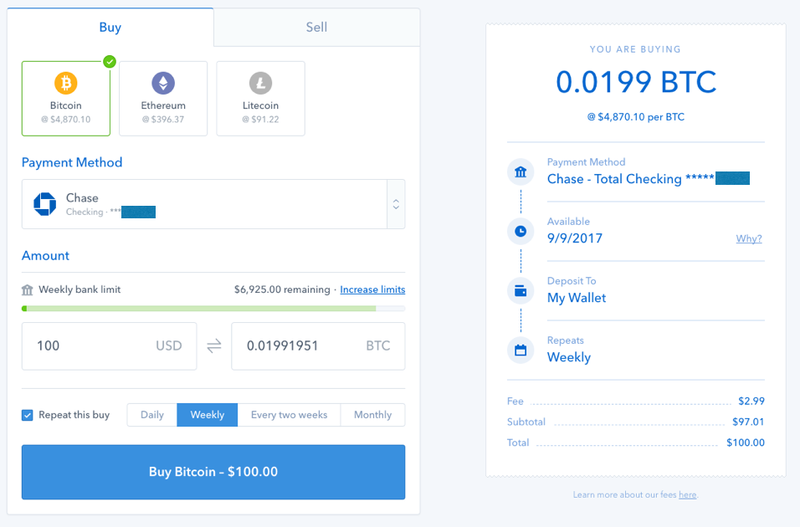 First: Open an account with Coinbase. You can use other exchanges for this too, but Coinbase is the one I’m most familiar with. Second: Set up a purchase for Bitcoin, Ethereum, and Litecoin, at whatever amount you want to invest, to recur weekly. I’ve been doing a ratio of 2:2:1 of Bitcoin : Ethereum : Litecoin and it’s been working out well. Third: Let it run and don’t touch it! As long as you can ride out the ups and downs, if the prices of these coins increase over time, you’ll be exposed to a lot of the upside without having to take the risk of trying to perfectly time the market.